For the past couple months Amazon has enabled authors and publishers to give away ebooks as contest prizes via Amazon.com - so long as the ebooks were paid for. Now Amazon is offering authors a better option. On Tuesday Goodreads announced a new Kindle ebook giveaway program. The author or publisher of a book – whoever controls the digital distribution rights to the book – can now offer up to 100 copies of the Kindle ebook in a giveaway. 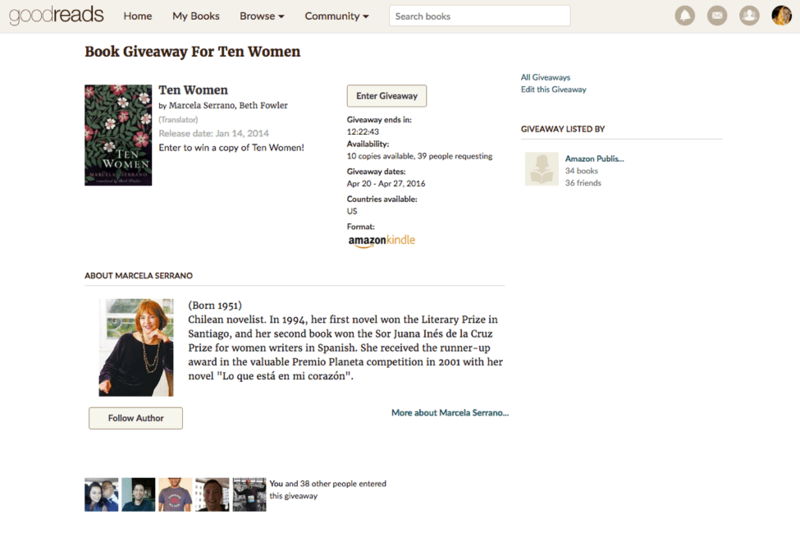 The author or publisher chooses how long the giveaway will run, and Goodreads does the rest. At the end of the giveaway, Goodreads randomly chooses winners and automatically sends the Kindle ebooks to their preferred devices and Cloud accounts. Winners receive real Kindle ebooks, complete with all the great features and security that Amazon’s Kindle platform provides. Authors can choose to run a contest before a book is published (it just has to be uploaded into the Kindle Store), and they can limit the number of copies in the contest (I see contests with only 50 copies available). Giving away those (up to) 100 ebook copies costs a flat $119 per contest. And while we're on the topic, listing a print book for a free giveaway, however, will continue to be free - but you still have to mail the print book yourself. The program is launching in beta with 8 titles, all of which are published by Amazon, and it is currently limited to only Goodreads members in the US (this restriction apparently applies to both the contest entrants and the authors running the contest). "The $119 fee is ridiculous and is punishing people (indie authors, particularly) for not having hard copy books," writes one author. "Amazon allows you to do free giveaways which is why so many people use it. I was excited to see that this service would be available, but saw in the end that you intended to exploit indie authors the way everyone does (including Amazon). But thanks for saving us the "cost and hassle." Between the high prices for Goodread ads and this new 'service,' how is any independent writer supposed to get ahead in the world? Thanks...but no thanks." Considering that this program merely adds another option without depriving authors of the chance to give away their ebooks in the Kindle Store or elsewhere, I don't see the problem. I was under the impression that Amazon owned Goodreads. If that’s true, then that would ultimately make Amazon the culprit. Amazon purchased Goodreads a few years ago. Goodreads, like Audible, Zappos, Kiva, IMDB, Twitch, and many other Amazon subsidiaries runs independently from Amazon.com, Kindle, and APub. Especially the latter two, for reasons of credibility. They obviously cooperate often but not always and neither management team is responsible for the others. If Jeff Bezos were to tell me that I must pay him $119 when I choose to give a copy of my e-book to someone, I believe that I would offer him the opportunity to expand an orifice of his through vigorous insertion. A cost of $119 with up to 100 eBooks included sounds reasonable to me. The paperback cost and shipping is much higher for authors, although many send only a few for their GR contests. My understanding is GR will also send the eBooks out, which saves the author time and hassle. What am I missing? Hmmm, seems a bit steep of a ‘fixed’ cost for what is no doubt an automated system that just emails out free download links to the winners. I would bite at maybe 1/4 of that cost though. i have been on goodreads for years and have received a large number of free ebooks directly from authors (via email) for fair reviews. It’s a bit steep simply because a lot of authors (including me) do those giveaways and tend to keep it to twenty books. That means my cost per ebook in such a giveaway is stupidly high. I can give away books on my blog at no cost to me. Of course, it’s the larger audience I’d be paying for. Unfortunately for Amazon, I’ve done multiple print copy giveaways on GR and I’ve seen very little benefit. I don’t believe the ebook giveaways would be any more successful. Readers do add the books to their shelves, but I think they are promptly forgotten about for the most part because not everyone organizes their shelves and not everyone goes back and reads every book on there. I didn’t find GR advertising to be effective with print so I’m not likely to try it with ebook. I don’t think it’s exploiting authors to charge them, but like a lot of programs out there, they aren’t flexible. And like too much advertising out there, it isn’t effective enough. Yes, I remember looking into the Amazon giveaway program and being dumbfounded that Amazon still charges the author for digital copies. For authors and publishers, the only cost is a one time premium membership fee of $25. For readers, feel free to sign up for review copies which interest you! I would not call the selection particularly impressive, but some titles are excellent. Most authors send out Smashwords coupon codes to potential reviewers. I think $119 is excessive, but I think the ability to purchase ebooks at reduced rates (say 50 cents) would make this much more tempting. With regard to Maria’s excellent comment, I want to say that I agree it’s easy to misplace review copies in digital collections. Google Play Books, for example, doesn’t seem to offer bookshelves at all. It costs nothing to do a CreateSpace version. So, I don’t think it’s unfair to Indies who choose not to use CreateSpace to make a paperback version of their books.